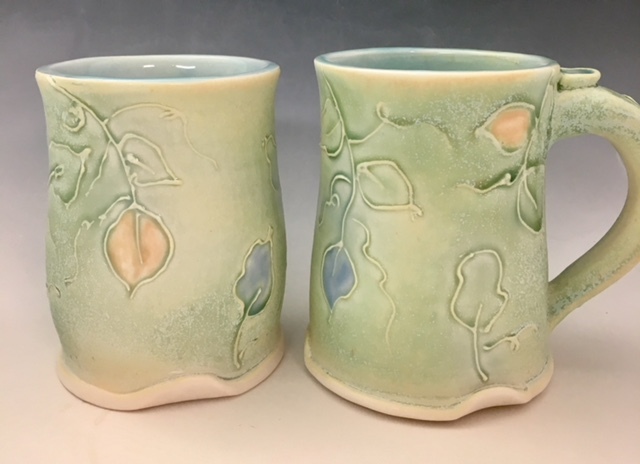 Side Door Pottery is another of the great artists you will meet at my Fall Art Bash. If you have been to one of my studio sales in recent years you would have seen her work. 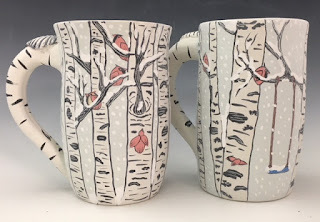 Side Door Pottery is whimsical painted porcelain that is functional for everyday but elegant enough for special gifts. It is all hand painted in exquisite detail and one of a kind. Plates, bowls, cups, serving pieces and pitchers. Tiles and sculptures. Garden art. There is something for every taste. Another artisan you will meet at my Fall Art Bash is Dixie with Eastern Wind Glass. One of Dixie's first creative endeavors was studying fashion design. From there she went into retail management. She took her love of color and texture from fabrics to glass. She has been working with stained glass for more than 20 years and fused glass almost as long. She opened her shop in 2008 to share her knowledge of glass and provide a place for other glass makers to find supplies and take classes. 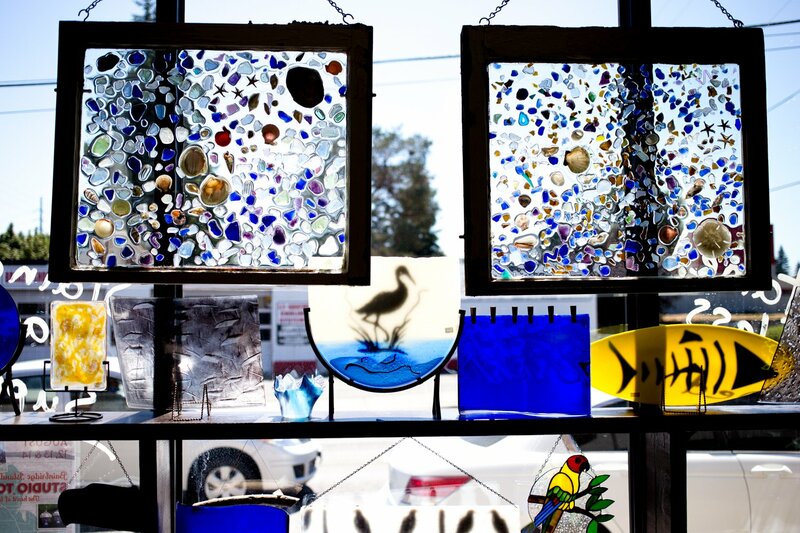 Eastern Wind Glass is located in downtown Bremerton near the corner of Callow on Burwell.There you will find an assortment of supplies for glass art making, both stained glass and fused glass. Have a stained glass piece that needs repair? Contact the shop to discuss your needs. Or perhaps you have an idea for a custom piece in mind. They also have glass art from several glass artists for sale. And they offer a wide variety of classes. There are classes in both stained and fused glass for kids and adults. They provide all the tools. Classes include beginner and advanced classes. See the full schedule on her website. 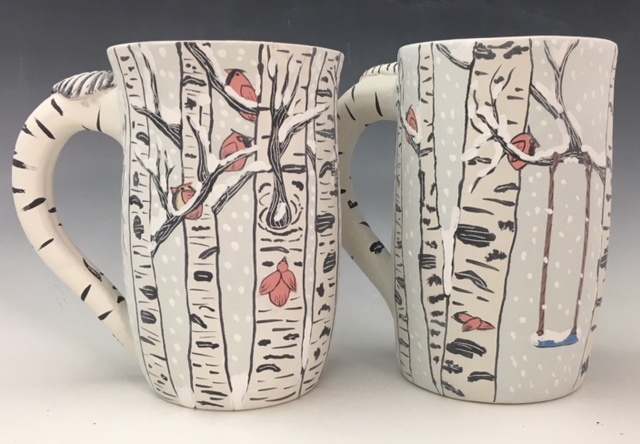 For those who already have the skills studio and kiln time can be purchased. Classes also are posted on their Facebook page. Check the website for the store hours and be sure to stop in the next time you are in Bremerton. Last month I used up the last of these pretty snakeskin jasper teardrops. Some of these stones have such intricate patterns. One on right is sold. Snakeskin jasper is a stone of protection and invisibility. Always makes me think of Harry Potters cloak! It guards against negative attitudes and actions. Its energy is useful in moving energy and can be helpful during massage. It can also be helpful during meditation, bringing one peace of mind. Snakeskin jasper is also thought to bring productivity and abundance to our minds and bodies. One on left is sold. My next featured artist is new to my studio shows. Meet Shannon Hull, a landscape and wildlife photographer based in Seabeck, Washington. She creates wall art, greeting cards, calendars and keepsakes of photos taken in Washington and other areas she has traveled. Professionally she has worked as videographer and editor for the past 18 years. Her career has given her the opportunity to travel all over the world. Shannon says "I have always been in awe of its beauty and of the amazing animals we share it with. I almost always have a camera near by to capture it." In the past few years,she has started picking up her still camera more than her video camera. Shannon appreciates the stories she can tell in a single frame as well as the thousands she shoots in a video. She started Shannon Hull Photography to showcase these photos. Come see Shannon's work in person to experience the world through her eyes. Visit her website and Facebook pages to get a peek at more of her amazing work than I can feature here.